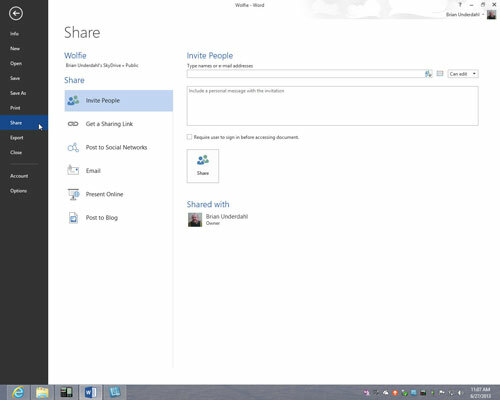 In SkyDrive, select the file or folder you want to share. 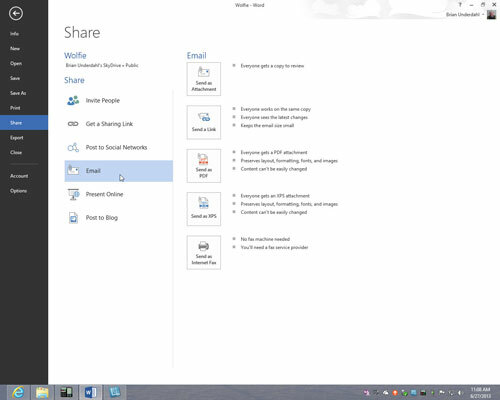 You can also start by opening the Office file you want to share. Click the Share (or Share Folder) button or link. 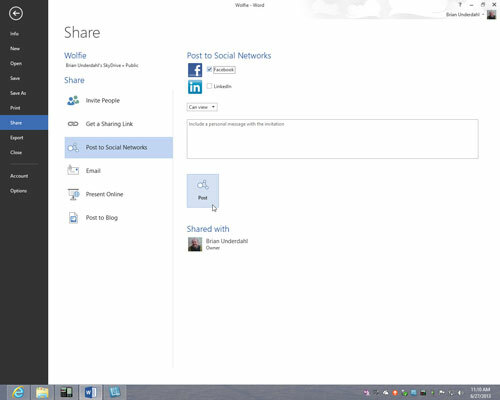 You can find the Share button or link here, there, and everywhere: on the SkyDrive toolbar; in the Details pane; in an open Office file, by clicking the Share tab; or in an open Office file by clicking the File tab, choosing Share, and choosing Share with People in the Share window. Choose Send Email, Post To, or Get a Link to generate the link to your file or folder. Send by e-mail: Enter the e-mail addresses of the people with whom you will share the file or folder. Enter a message as well if you want. Post to a social-networking site: Click the logo of the site. If the logo doesn’t appear, click the Add Services link to add a site to the list of social-networking sites to which you can post. Get a link: Click one of the three Create buttons. 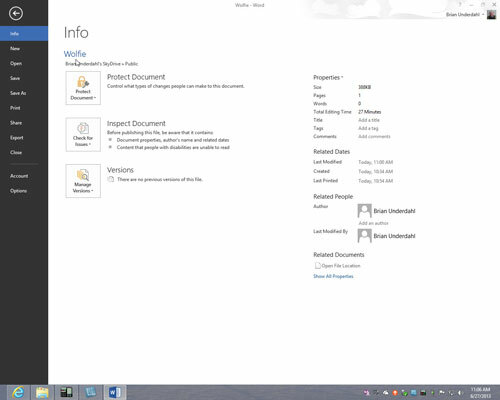 After you click Create, SkyDrive generates a link. Right-click to copy it. Choose the degree to which you will share the file. Send by e-mail: Clear all check boxes if you want people who receive the e-mail to view the file only; select Recipient Can Edit if you want recipients to be able to edit the file (to edit, they have to sign in to a Microsoft Account); select Require Everyone Who Accesses This to Sign In if you want only people with Microsoft Accounts to view the file. Post to a social-networking site: Select Recipients Can Edit to allow people who click the link on the social-networking site to edit as well as view your file (to edit, they have to sign in to a Microsoft Account). Get a link: Decide which of the Create buttons you want to click. Click the Share button (Send by Email), the Post button (Post To), or the Done button (Get a Link).